The model 1000C series instrument is a computerized eight-channel potentiostat. The system contains a digital function generator and multiplexed data acquisition circuitry. The multi-potentiostat can work with eight independent cells or eight working electrodes in the same solution with common reference and counter electrodes. The potential control range is ±10 V for all channels and the current range is ±10 mA. The instrument is capable of measuring current down to picoamperes. Each electrode can be individually controlled, including on/off control, potential, and sensitivity settings; each can be set to an independent potential or the same potential as the primary channel, so that they can sweep or step potentials together with the primary channel. The model 1000C series is an upgrade to the model 1000/1000A/1000B series. The instrument allows eight independent cells, simultaneous or sequential measurements, fast waveform generation and data acquisition speed (1 MHz @ 16-bit), and easy software update using flash memory. 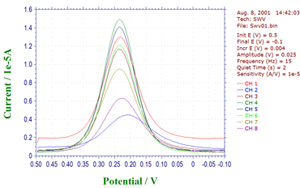 Many electrochemical techniques are available in the 1000C series, including cyclic voltammetry and amperometric i-t measurements, with all eight channels available (except for open circuit potential measurements). 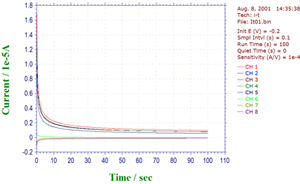 The parameters for all channels must be set before running an experiment; you cannot alter parameter settings during experiments. During a run, you can toggle between single and multi-data set display (parallel or overlay plots). After a run, you can choose data from any channel for parallel or overlay plotting. The instrument can be controlled by an external PC running Windows 98 or higher. It is easy to install and use. The instrument connects to your PC using USB (default) or serial port connectivity; no plug-in card or other hardware is required on the PC side. The commands, parameters, and options have been written using terminology that most chemists are familiar with. A customizable toolbar allows quick access to the most commonly used commands. A comprehensive help system provides context-sensitive information from each dialog box. The instrument provides many powerful functions, such as straightforward file handling, extensive experimental control, flexible graphics, various data analyses, and efficient digital simulation. Additional features include macro commands, working electrode conditioning, color, legend and font selection, data interpolation, visual baseline correction, data point removal, visual data point modification, signal averaging, Fourier spectrum, and a convenient technique-specific electrochemical equation viewer. The maximum data length is 128K – 8192K points (selectable) if real-time data transfer is allowed.